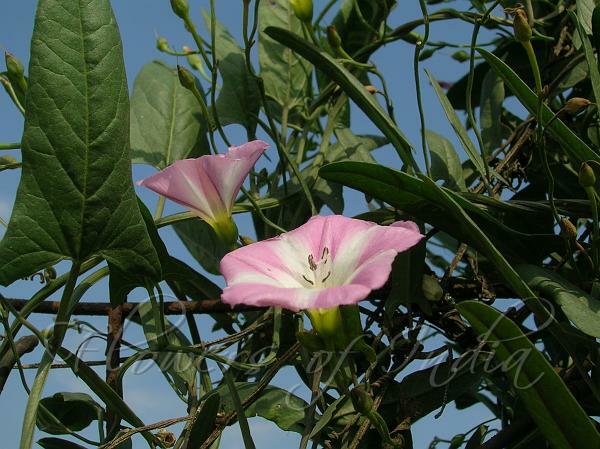 Field Bindweed is a climbing or creeping herbaceous perennial plant growing to 0.5-2 m high. The leaves are spirally arranged, linear to arrowhead-shaped, 25 cm long and alternate, with a 1-3 cm leaf-stalk. The flowers are trumpet-shaped, 1-2.5 cm diameter, white or pale pink, with five slightly darker pink radial stripes. Flowering occurs in the mid-summer, when white to pale pink, funnel-shaped flowers develop. Flowers are approximately 2.0-2.5 cm across and are subtended by small bracts. Fruits are light brown, rounded and 3 mm wide. Each fruit contains 2 seeds that are eaten by birds and can remain viable in the soil for decades. 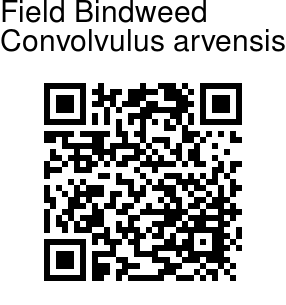 Field Bindweed is generally considered a weed. Field Bindweed is native to Native to Europe and Asia. Identification credit: Navendu Pagé, Vinay R. Kolte Photographed in Sundar Nursery, Delhi.